Mesquite trees (Prosopis spp.) are commonly grown in desert landscapes where their deeply reaching roots allow them to survive in brutally hot and dry situations. If soil moisture is limited, they remain shorter and shrub-like, but with just enough water they develop into wispy, irregularly shaped trees quite quickly, upwards of 20 to 30 feet tall. Use them as a source of light shade in U.S. Department of Agriculture hardiness Zones 8 or warmer. The botanical genus Prosopis comprises nearly 45 different species of trees or shrubs, all native to deserts of the southwestern United States, Mexico and in arid pockets across Central and South America as far south as Argentina. All mesquites belong to the pea family Fabaceae. 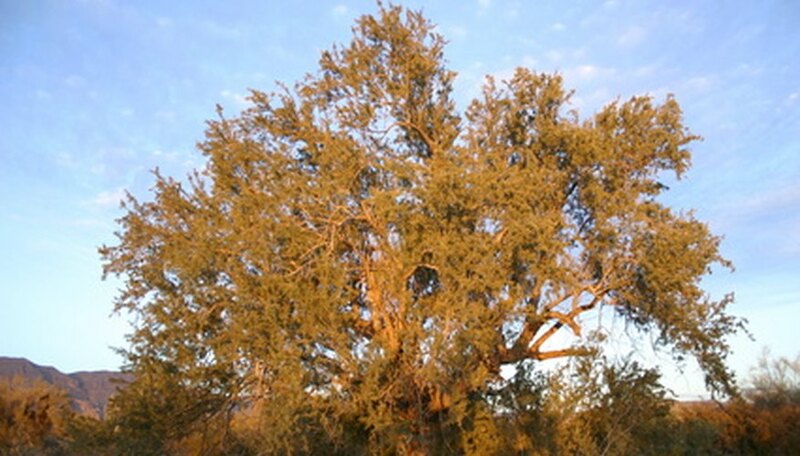 There are five species of tree-like mesquites worth noting and unfortunately they all can hybridize with each other to create new trees that are difficult to identify, according the "Sunset Western Garden Book:" Argentine mesquite (Prosopis alba), Chilean mesquite (P. chilensis), honey or Texas mesquite (P. glandulosa), screwbean mesquite (P. pubescens) and Arizona or velvet mesquite (P. velutina). Mesquite trees bear thorny branches emanating from either a singular or multiple trunks that are covered in reddish to dark brown bark. The leaves are compound and feathery, each made up of small oblong leaflets of green to blue-green or olive green. Clusters of yellowish pea-shaped blossoms occur among the leaf bases and provide a source of nectar to bees in spring and summer. The pods that subsequently form are hard but eventually split open to drop the seeds. Plant any mesquite tree in a fast-draining soil that contains little to average garden-setting fertility in a sunny spot, receiving at least 10 hours of direct sunshine daily. To develop upright, tree-like plants, irrigate during the heat of summer to promote rapid growth; with a little water they might remain wispy-looking shrubs. They can be added to water conservation gardens, but if you plant them in residential yards consider buying varieties with thornless branches from a plant nursery. According to the Texas State Historical Association, Native Americans in the Southwest utilized all parts of mesquite trees, from leaves and flowers to the bark, wood and gooey gum. The wood resists rot and makes good fencing material and burning the contorted wood adds an earthly flavor to roasted meats. In the American Civil War, mesquite pods where boiled to make a coffee beverage substitute. Some artisans make rustic-looking furniture from mesquite as well as small wood ornaments, utensils and flooring planks even though finding large-sized trunks and branches that lack irregular knots or shapes can be challenging.